Digitalization is driving major changes in partner and customer expectations, and enterprises can no longer rely on largely manual onboarding processes and discrete tools to somehow onboard trading partners and execute B2B transactions. So how do enterprises address this dilemma? 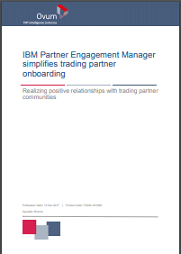 Read this “Ovum view” paper on the state of trading partner on-boarding and relationship management. See how IBM’s Partner Engagement Manager (PEM) offering is helping enterprises address core, re-occurring issues with managing a complex and sometimes global mix of partners.